Let's face it, the fashion industry is saturated. We can't all be famous designers (although with some effort and some luck we could be working for them). A fashion designer may just need to find his niche market and create his signature style to stand out from the rest while scraping out a living. Trends can guide you but there is a dangerous line between creating a style each season and blind "carbon copying" of the latest trends. Part of creating a unique collection is knowing what is already out there. Get to know your colleagues/competitors. The other is to expose yourself outside your comfort zone. Be bold and experiment with something unfamiliar to you. If you are a left-brain person take a right brain class in something and vice-versa. Newly acquired knowledge will usually lend itself immediately through your design. It is then incorporated into the pool of knowledge that makes you....well...YOU. Remember, fabric is flat and virtually everything has been done in the Euclidean sense. Use some projective geometry. Textiles can and should be sculpted. Use pleats and folds for example. Try crumpling and topstitching or combining hard fabrics with soft. 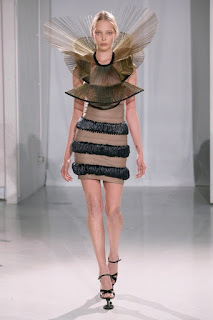 Iris van Herpen has some incredibly inspired designs. See Pleatfarm.com to immerse yourself in the art of folding in all industries.